Three models of expert-public interaction in science and technology communication are central: the dissemination model (often called the deficit model), the dialogue model, and the participation model. These three models constitute a multi-model framework for studying science and technology communication and are often described along an evolutionary continuum, from dissemination to dialogue, and finally to participation. Underlying this description is an evaluation claiming that the two latter are “better” than the first. However, these three models can coexist as policy instruments, and do not exclude each other. Since 1975, concerns with public engagement over time have led to a mode that is more dialogical across the three models within science and technology communication policy in Norway. Through an active policy, sponsored hybrid forums that encourage participation have gradually been developed. In addition, social media increasingly allows for spontaneous public involvement in an increasing number of hybrid forums. Dialogue and participation thus have become crucial parts of science and technology communication and format public engagement and expertise. AAD. 1992. Ikke bare ord...Statlig informasjon mot år 2000. edited by Arbeids- og administrasjonsdepartementet. Oslo. Alme, P. 1995. “Forskningsresultater må formidles!” Aftenposten, November 6. Andersen, E. K., and H. Hornmoen. 2011. Mediating Science in Norway: Practices and Transformations in Major Newspapers. Media Transformations 5:88-104. Bauer, M. W., and M. Bucchi, eds. 2007. Journalism, Science and Society: Science Communication between News and Public Relations. New York: Routledge. Bech-Karlsen, J. 1996. Ubehaget i journalistikken. Oslo: Forlaget Forum. Bentley, P., and S. Kyvik. 2011. Academic staff and public communication: a survey of popular science publishing across 13 countries. Public Understanding of Science 20 (1):48-63. Bowker, G., and S. L. Star. 1999. Sorting Things Out: Classification and its Concequences. Cambridge, Massachusetts: The MIT Press. Braun, K., and S. Schultz. 2010. ”... a certain amount of engineering involved”: Constructing the public in participatory goverance arrangements. Public Understanding of Science 19 (4):403-419. Brint, S., and A. M. Cantwell. 2012. Portrait of the disengaged. In Research & Occasional Paper Series: CSHE.9.12. Berkeley: University of California. Broks, P. 2006. Understanding Popular Science. Maidenhead: Open University Press. Brossard, D., and B. V. Lewenstein. 2010. A Critical Appraisal of Models of Public Understanding of Science. In L. Kahlor and P. A. Stout (eds.) Communicating Science: New Agendas in Communication: 11-39. New York: Routledge. Bucchi, M., and B. Trench, eds. 2008. Handbook of Public Communication of Science and Technology. London: Routledge. Callon, M. 1999. The Role of Lay People in the Production and Dissemination of Scientific Knowledge. Science, Technology & Society 4 (1):81-94. Callon, M., P. Lascoumes, and Y. Barthe. 2009. Acting in an Uncertain World: An Essay on Technical Democracy. Cambridge. Massachusetts: The MIT Press. Collins, H., and R. Evans. 2007. Rethinking Expertise. Chicago: The University of Chicago Press. Delgado, A., K. L. Kjølberg, and F. Wickson. 2011. Public engagement coming of age: From theory to practice in STS encounters with nanotechnology. Public Understanding of Science 20 (6):826-845. Dickinson, J. L., and R. Bonney, eds. 2012. Citizen Science: Public Participation in Environmental Research. Ithaca: Comstock Publishing Associates. Eide, M., and R. Ottosen. 1994. ”Science journalism” without science journalists: notes on a Norwegian media paradox. Public Understanding of Science 3 (4):425-434. European Commission. 2010. Special Eurobarometer - Science and Technology Report. Evans, R., and H. Collins. 2010. Interactional Expertise and the Imitation Game. In M. E. Gorman (ed.) Trading Zones and Interactional Expertise: 53-70. Cambridge, MA: The MIT Press. Eysenbach, G. 2008. Medicine 2.0: Social Networking, Collaboration, Participation, Apomediation, and Openness. Journal of Medical Internet Research 10 (3):1-9. FAD. 1978. Offentlig informasjon. edited by Forbruker- og administrasjonsdepartementet. Oslo. FAD. 2009. Statens kommunikasjonspolitikk. edited by Fornyings- og administrasjonsdepartementet. Oslo. Fagerberg, J., D. C. Mowery, and R. R. Nelson, eds. 2005. The Oxford Handbook of Innovation. Oxford: Oxford University Press. Finne, H., and P. Hetland. 2005. Meritteringssystemer i FoU-sektoren i forhold til nærings- og innovasjonsrettet FoU-virksomhet. In Arbeidsnotat. Oslo: Nordic Institute for Studies in Innovation, Research and Education. Funtowicz, S. O., and J. R. Ravetz. 1992. Three types of risk assessment and the emergence of postnormal science. In S. Krimsky and D. Golding (eds.) Social theories of risk: 251-274. Westport, Conn.: Praeger. Gibbons, M., C. Limoges, H. Nowotny, S. Schwartzman, P. Scott, and M. Trow. 1994. The New Production of Knowledge: The dynamics of science and research in contemporary societies. London: Sage. Gieryn, T. F. 1999. Cultural Boundaries of Science. Chicago: The University of Chicago Press. Hess, D. J. 2011. To tell the truth: on scientific counterpublics. Public Understanding of Science 20 (5):627-641. Hetland, P. 1996. Exploring Hybrid Communities: Telecommunication on Trial. PhD, Department of Media and Communication, University of Oslo. Hetland, P. 2011. Science 2.0: Bridging Science and the Public. 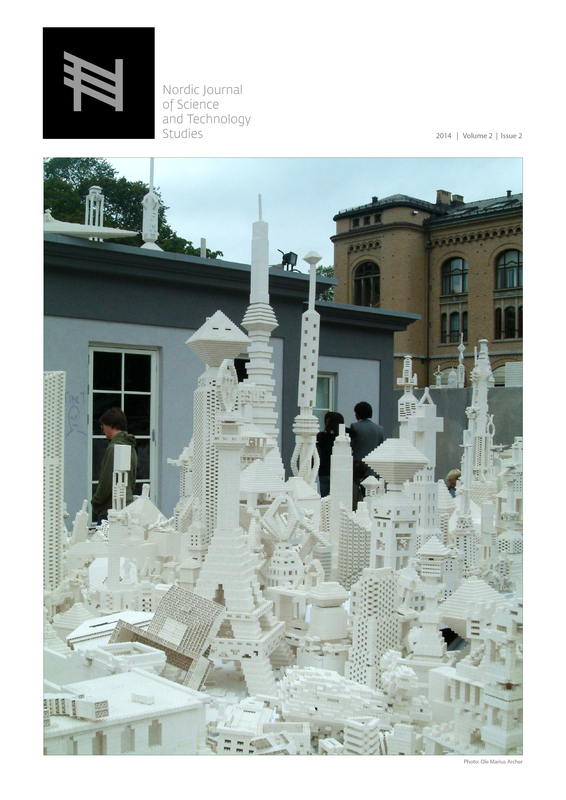 Nordic Journal of Digital Literacy 6 (Special Issue):326-339. Hetland, P. 2012. Internet between Utopia and Dystopia: The Narratives of Control. Nordicom Review 33 (2):3-15. Hilgartner, S. 1990. The Dominant View of Popularization: Conceptual Problems, Political Uses. Social Studies of Science 20 (3):519-539. HOD. 2010. Samspill 2.0: Nasjonal strategi for elektronisk samspill i helse- og omsorgssektoren 2008-2013. Helse- og omsorgsdepartementet. Oslo. Holm, E. D. 2000. Da forskningen forlot parnasset - fortellingen om formidlingen fra KULT. Oslo: Pax Forlag. Informasjonsutvalget. 1962. Innstilling fra informasjonsutvalget. edited by Finans- og tolldepartementet. Oslo. Irwin, A., and M. Michael. 2003. Science, Social Theory and Public Knowledge. Maidenhead: Open University Press. Kallerud, E., T. Finnbjørnsson, L. Geschwind, M. Häyrinen-Alestalo, I. Ramberg, K. Siuene, and T. Tuominen. 2011. Public Debate on Research Policy in the Nordic Countries: A Comparative Analysis of Actors and Issues (1998-2007). Oslo: Nordic Institute for Studies in Innovation, Research and Education. Kasperowski, D., and F. Bragesjö. 2011. Bilda och samverka - om införandet, implementering och förändringen av universitetens tredje uppgift 1977-1997. Göteborgs Universitet: Institutionen för filosofi, lingvistik och vetenskapsteori. KD. 2010. Realfag for framtida - Strategi for styrking av realfag og teknologi 2010-2014. edited by Kunnskapsdepartementet. Oslo. Kyvik, S. 2005. Popular Science Publishing and Contributions to Public Discourse among University Faculty. Science Communication 26 (3):288-311. Lasswell, H. 1948. The structure and function of communication in society. In L. Bryson (ed.) The Communication of Ideas. New York: Institute for Religious and Social Studies. Le Marec, J., and I. Babou. 2008. Word and Figures of the Public: the Misunderstanding in Scientific Communication. In D. Cheng, M. Claessens, T. Gascoigne, J. Metcalfe, B. Schiele and S. Shi (eds.) Communicating Science in Social Contexts: 39-54. Springer Science. Lewandowsky, S., K. Oberauer, and G. Gignac. 2013. NASA faked the moon landing - Therefore (Climate) Science is a Hoax: An Anatomy of the Motivated Rejection of Science. Psychological Science 24 (5):622-633. Leydesdorff, L., and H. Etzkowitz. 1998. The Triple Helix as a Model for Innovation Studies. Science & Public Policy 25 (3):195-203. Løvhaug, J. W. 2011. Overlæreren i rampelyset: Universitetet i mediesamfunnet 1970-2011. In J. P. Collett (ed.) Universitetet i Oslo 1811-2011. Oslo: UNIPUB. MD. 2009. Norway’s National Report on Implementation of the Convention on Biological Diversity. edited by Miljødepartementet. Oslo. Nelkin, D. 1995. Selling Science. How Press Covers Science and Technology. New York: W. H. Freeman and Company. NFR. 1996. Strategi for forskningsformidling med hovedvekt på brukerrettet formidling. Oslo: Norges forskningsråd. NFR. 1997. Nasjonal strategi for allmennrettet forskningsformidling. Oslo: Norges forskningsråd. NFR. Ongoing. Science and Technology Indicators for Norway. Norges forskningsråd. Nielsen, A. P., J. Lassen, and P. Sandøe. 2007. Democracy at its best? The Consensus Conference in a Cross-National Perspective. Journal of Agricultural and Environmental Ethics 2007 (20):13-35. Nowotny, H., P. Scott, and M. Gibbons. 2001. Re-thinking science: Knowledge and the public in an age of uncertainty. Cambridge: Polity Press. Perrault, S. T. 2013. Communicating Popular Science: From Deficit to Democracy. New York: Palgrave Macmillan. Rip, A. 2003. Societal challenges for R&D evaluation. In P. Shapira and S. Kuhlmann (eds.) Learning from Science and Technology Policy Evaluation: 32-53. Cheltenham: Edward Elgar. Rogers, E. M. 2003. Diffusion of Innovations. New York: Free Press. Skoie, H. 2005. Norsk forskningspolitikk i etterkrigsstiden. Oslo: Cappelen Akademisk Forlag. Slagstad, R. 2006. Kunnskapens hus. Oslo: Pax Forlag. Snow, C. P. 1963. The Two Cultures: A Second Look. Cambridge: Cambridge University Press. Suerdem, A., M. W. Bauer, S. Howard, and L. Ruby. 2013. PUS in turbulent times II - A shifting vocabulary that brokers inter-disciplinary knowledge. Public Understanding of Science 22 (1):2-15. Toy, J. 2002. The Ingelfinger Rule: Franz Ingelfinger at the New England Journal of Medicine 1967-1977. Science Editor 25 (6):195-98. Trench, B. 2008. Towards an Analytical Framework of Science Communication Models. In D. Cheng, M. Claessens, T. Gascoigne, J. Metcalfe, B. Schiele and S. Shi (eds.) Communicating Science in Social Contexts: New models, new practices: 119-135. Netherlands: Springer Science+Business Media B.V.
Tydén, T. 1993. Knowledge Interplay - User-Oriented Research Dissemination through Synthesis Pedagogics. PhD, Uppsala University (Uppsala Studies in Education). UHR. 2005. Sammen om kunnskap - Nytt system for dokumentasjon av formidling. UHRs formidlingsutvalg til UFD. Oslo. UHR. 2006. Sammen om kunnskap II - Operasjonalisering av indikatorer for formidling. UHRs formidlingsutvalg II til KD. Oslo. Väliverronen, E. 1993. Science and the media: changing relations. Science Studies 6:23-34.